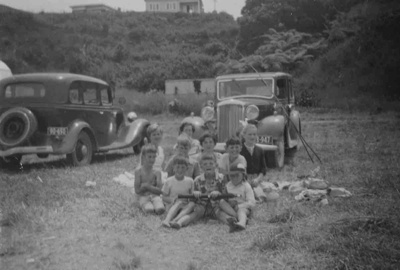 Worsfold family at Mangawhai Heads beach on Boxing Day in the 1950's. Middle Row L to R: Elisabeth Worsfold, Chris Ries, Jane Worsfold, unknown boy smiling, unknown girl in dark cardigan. Front Row L to R : Terrance Leabourn (folded arms), Howard Ries, Bill Worsfold, Peter Worsfold (hat). Josephine Molly Worsfold, known as Jo, nee Bowmar b 1917 d 2007. Married Frank Hamlyn, known as Ham, Worsfold in 1940. Molly Jane Worsfold, known as Jane, Josephine Anne Worsfold, known as Anne, Elizabeth Hamlyn Worsfold, William Gilbert Worsfold, known as Bill, and Peter Daniel Worsfold.